Natural construction complementing the location high in Oku-Shiga Kogen Mountains. Grand Phenix Okushiga strives to provide each guest a personal experience far removed from the stresses of daily life. Located deep in the Joshinetsu National Park, guests can enjoy beautiful nature all 4 seasons of the year, especially winter with the ski slopes being only 1 min away. The natural surroundings are reflected in the construction of the inn, featuring wood and stone and natural sunlight. 1 cm rise at the entrance to the guestrooms. From Nagano Station(JR Hokuriku(Nagano) Shinkansen), From bus stop #3 outside the east exit, take Nagaden bus bound for Shiga Kogen. 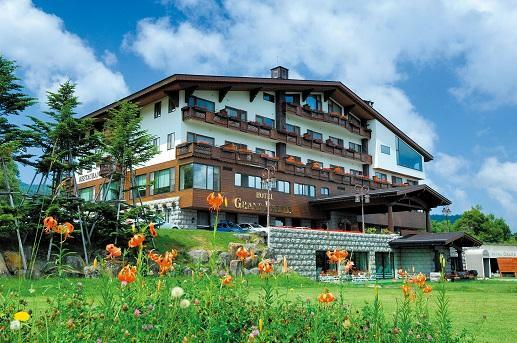 Get off at the Oku-Shiga Kogen Hotel (奥志賀高原ホテル)stop, then 2 min on foot. From Shinshu-Nakano IC, Via Route 292 to Shiga Kogen, approx. 80 min. Onsen-in-a-River: Kiriake Onsen : Dig Your Own Bath and Enjoy the Onsen Water Bubbling Up from the Riverbed.